Dr. Knotts graduated with honors from Indiana University School of Optometry in 1984. She has been in private practice for twenty years at this location. For a number of years, she served as a clinical assistant professor at I.U. School of Optometry specializing in ocular disease and gerontology. Since then she has served on the Dean's Advisory Board for Dean Jerry Lowther. Dr. Knotts has served at all levels in the Indiana Optometric Association including serving as it's President in 2000-2001. She currently serves as the IOA Legislative Chair. In April 2009, she was named the IOA Optometrist of the Year. She has also volunteered many hours to numerous other professional and community organizations. Dr. Knotts enjoys spending time with her patients to ensure they receive the personal service they deserve. Dr. Helton graduated with honors from Indiana University School of Optometry in 2010. She was an active member in the Beta Sigma Kappa International Optometric Honor Society as well as the American Optometric Student Association. She enjoyed being part of the Volunteer Optometric Services to Humanity. 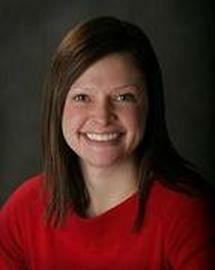 Nicole is currently an active member of the Indiana Optometric Association. Dr. Helton is very excited and honored to be a part of Knotts Optometry. She is looking forward to meeting existing patients as well as helping out with new ones. Dr. Helton is an active participant in the InfantSee program, and very much looks forward to bringing this program to Knotts Optometry. Dr. Helton grew up locally, graduating with high honors from Cathedral High School before attending Indiana University for undergraduate studies. Nicole and her husband Adam enjoy traveling, working out, spending time with family and friends and their dog Otis. We have an exceptionally professional staff. They will be happy to help you with all of your eye care needs.